Successfully Added Wireless Flexible PC Keyboard - Plug And Play Vista + XP to your Shopping Cart. Finally, a rugged keyboard that can withstand all kinds of abuse. This Wireless Flexible PC Keyboard can handle any situation and is super flexible, allowing you to roll it up and conveniently bring with you wherever you go. This lightweight, ultra-slim and compact keyboard is perfect for travel, school, or any work environment. Made out of high quality silicon rubber, this Wireless Flexible PC Keyboard is virtually indestructible and highly flexible, allowing it to easily fit in your briefcase, backpack, or notebook carrying bag. You won't even have to worry about any sharp edges or objects damaging the keyboard! Setup is extremely easy, just connect the USB dongle, insert 2 AAA batteries into the keyboard, and you're good to go with the perfect computer and laptop accessory. This Wireless Flexible PC Keyboard is also completely spill-proof and water resistant, making it great for personal use (easy cleaning for those who often drink and eat at their computer) as well as in public establishments like libraries, schools, internet cafes, and any place where you don't want to have to clean up after another person's mess. 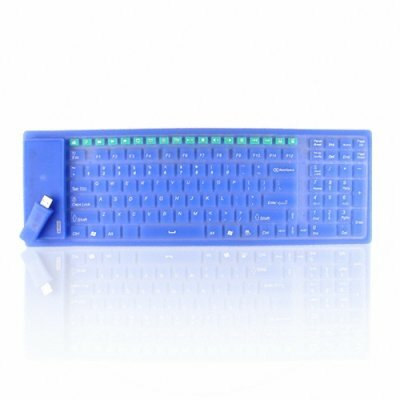 This Wireless Flexible PC Keyboard features a full QWERTY keypad with 104 standard keys and even includes 18 different one-touch keyboard shortcuts (including audio/video playback and checking email) for quick, mouse-free navigation. The keyboard's flat design and 10 meter wireless range makes it even more user-friendly, and allows typing without putting stress on your wrists or in uncomfortable positioning. Available in our warehouse now, order today and we'll ship it out tomorrow. buy yours at an unbelievably low wholesale price and don't forget to log in and see even greater discounts available by buying in bulk! Brought to you by the leader in wholesale electronics and tech gadgets - Chinavasion. Does this Wireless Flexible PC Keyboard require any special software? It is plug-and-play for XP, Vista (32 bit version only), and Windows 7 (32 bit version only). For other older Windows operating systems (2000, 98, ME, etc) there are drivers included on the CD. Does this Wireless Flexible PC Keyboard come in any other color/styles? For the black wired version, check out LK-7830.